Senior care companies require background checks for all employees. Professional senior care companies provide active management of the care and the caregiver and will only hire caregivers who pass criminal background checks. 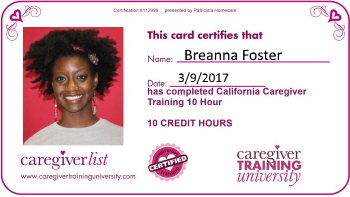 Past behavior can be one of the best indicators of future behavior, so reference and background checks are an important part of the caregiver hiring process. What caregiver background information do senior care companies research? Senior care companies will verify all employment history and run a criminal background check report on the caregiver before hiring. According to the Fair Credit Reporting Act (FCRA), the above information may only be reviewed for the past 7 years. However, each state enforces the FCRA and many states have their own consumer reporting laws which may provide more rights to consumers or require more disclosures of information. In addition, there may be information the agency can review, but cannot use to discriminate in hiring an applicant. View Video "How Employers Review a Caregiver Background Check". Learn about the background check laws by state. Purchase your own background check for $8 or $18 to verify the accuracy of the information.